Queen Anne’s Lace famous flower “nest” loaded with sticky seeds waiting for an unsuspecting carrier. Queen Anne’s Lace real name is Daucus carota and is actually a wild version of the domestically farmed Carrot! It was years of selective breeding which has transformed the wild carrot into the larger, sweeter, and more crisp version that we’re all familiar with. The species name carota is latin for Carrot which has been recognized by the Old World as a food and medicine throughout the ages. All parts are edible providing a wide range of culinary uses. 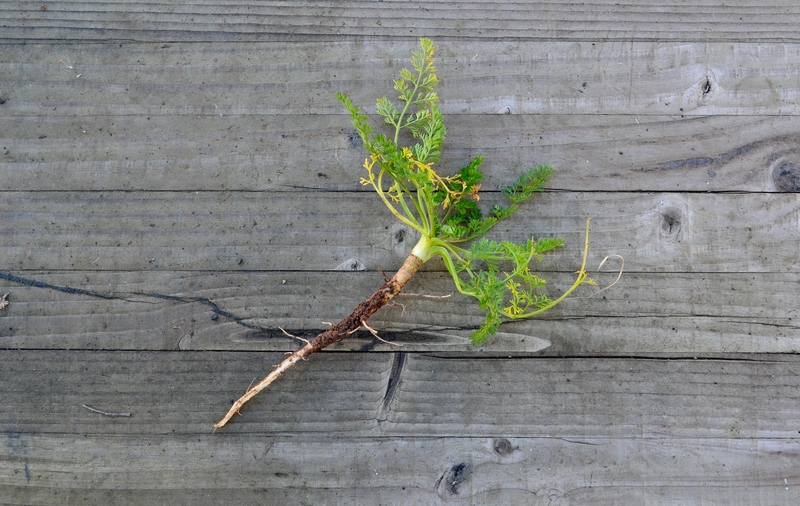 Wild Carrot’s first year roots are good cooked or raw. Mince the fresh leaves and use as a spice for soups and stews or add to a salad. Wild Carrot is a biannual growing its vegetation the first year, sending up a flower stalk and going to seed in the second year. First year roots are best harvested in the spring or fall when they are most tender. Second year roots will become stringy and woody as the plant fully matures. However during this time the flower stalk can be peeled and eaten as a crisp ‘carrot flavored’ vegetable either raw or cooked. The flower itself can be used as a flavoring agent, to garnish meals, or eaten as a vegetable, and the seeds may be used as a spice or brewed for tea. Genetically it’s believed that Wild Carrot is the direct progenitor to our modern Carrot. 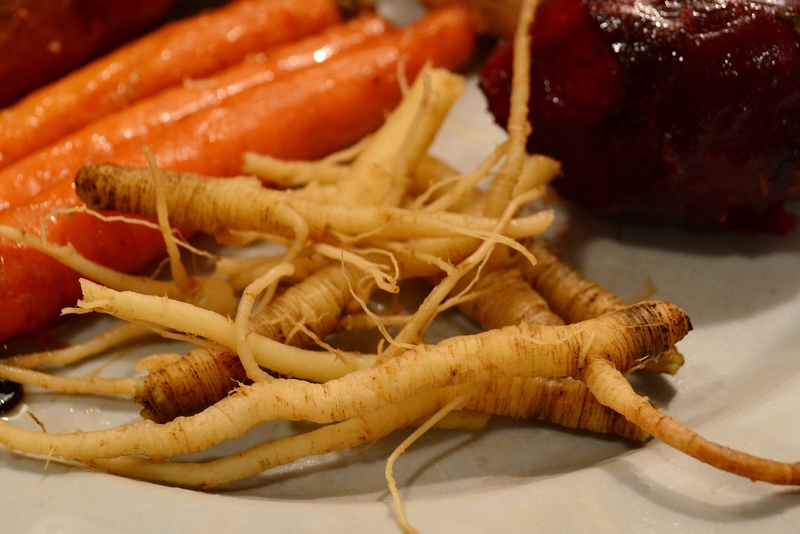 Steamed Wild Carrot root as seen in the foreground compared to its enhanced brother in the background. 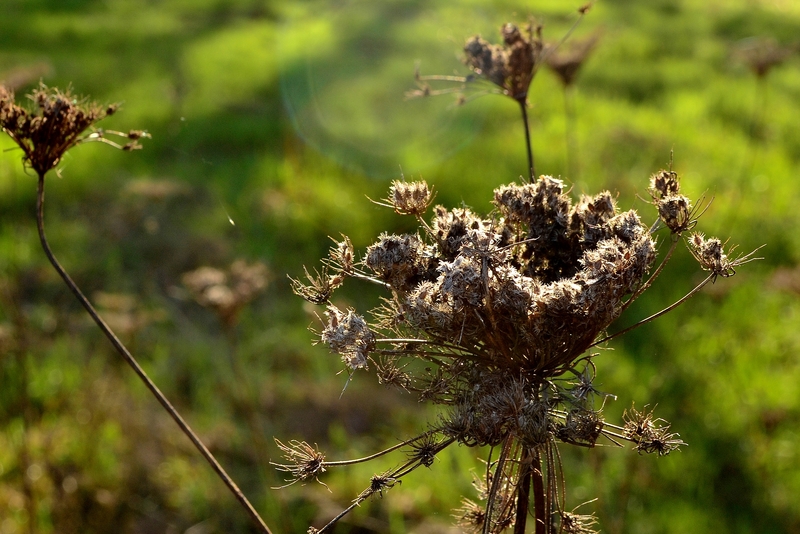 Wild Carrot is highly adaptable and has quickly naturalized itself around most of the world. It can be spotted growing in fields, meadows and garden beds year-round. 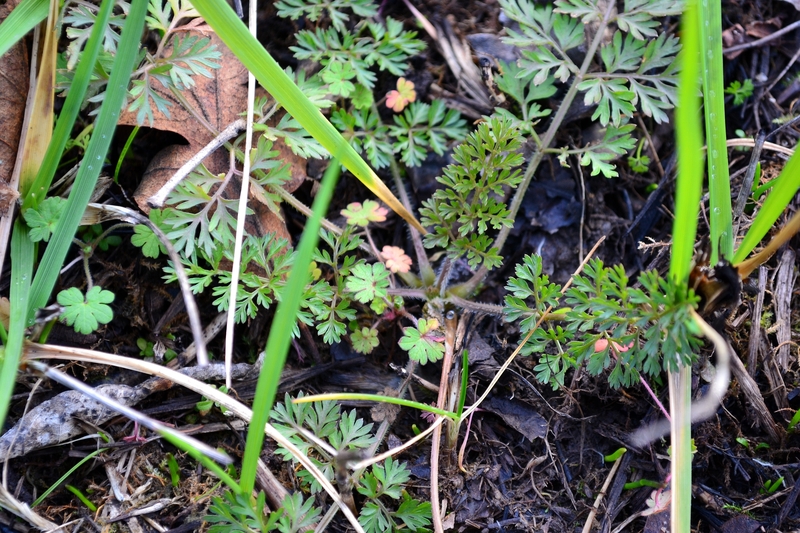 A relative of the Parsley, you can see the resemblance in its leaves. 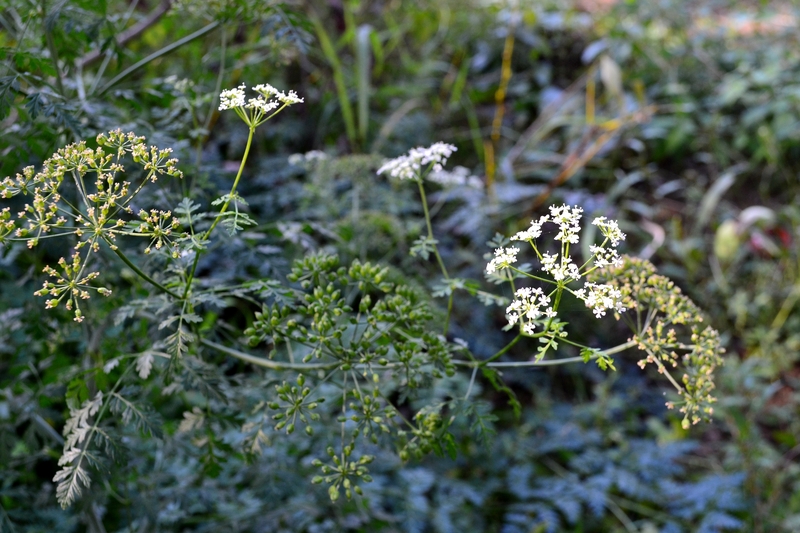 Also a relative of the Parsley is Poison Hemlock. 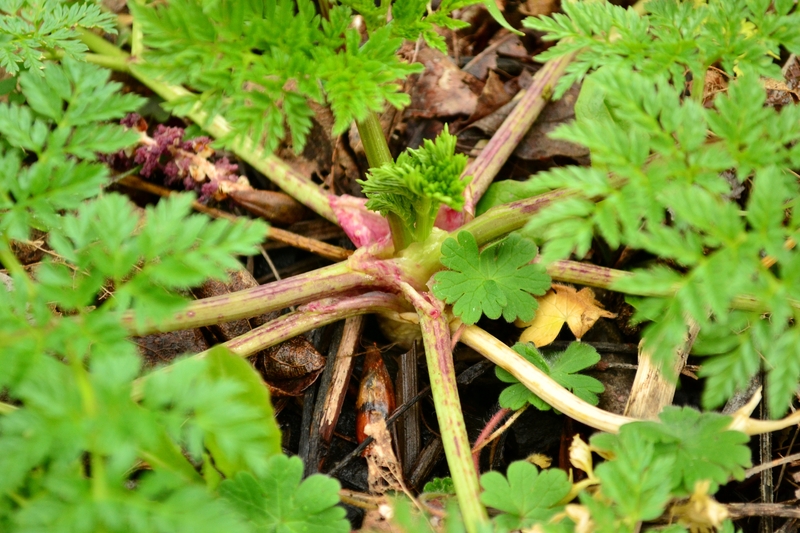 Before harvesting be confident in the noticeable differences between Wild Carrot and Poison Hemlock. 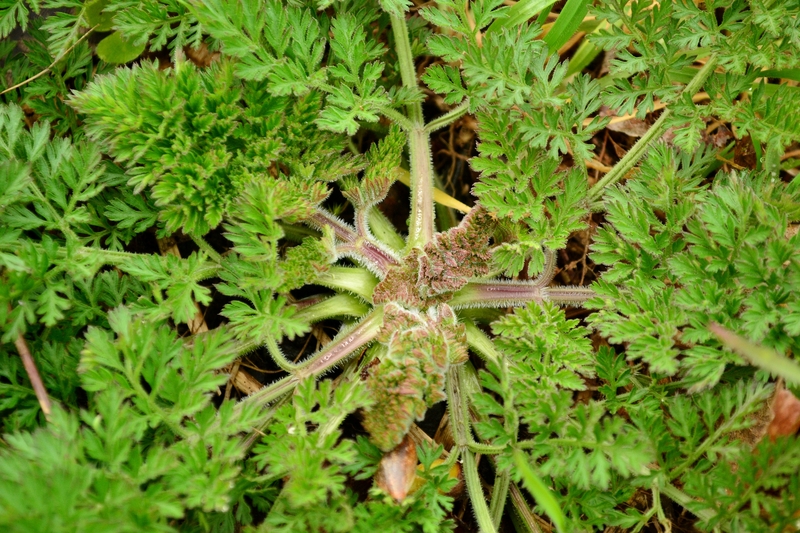 Daucus carota has been used to treat the bladder, kidney and liver. It has been reported to increase the flow of urine helping in the aid of kidney waste removal, countering the formation of kidney stones. The leaves have been reported to act as an aphrodisiac, while the plant may delay menstruation. The seeds are an old-time contraceptive and should not be used by pregnant women. An essential oil from the seeds can be applied to counter wrinkles. Wild Carrot and its Poisonous cousin. Wild Carrot on the left compared to Poison Hemlock (Conium maculatum) on the right. If you are relatively new at foraging you may discover what is known as a “lookalike”. Knowing the desired plant intimately will help you avoid mistaking it with any imposters. Wild Carrot may have a few different lookalikes but often times its spotted growing in close proximity with Poison Hemlock. 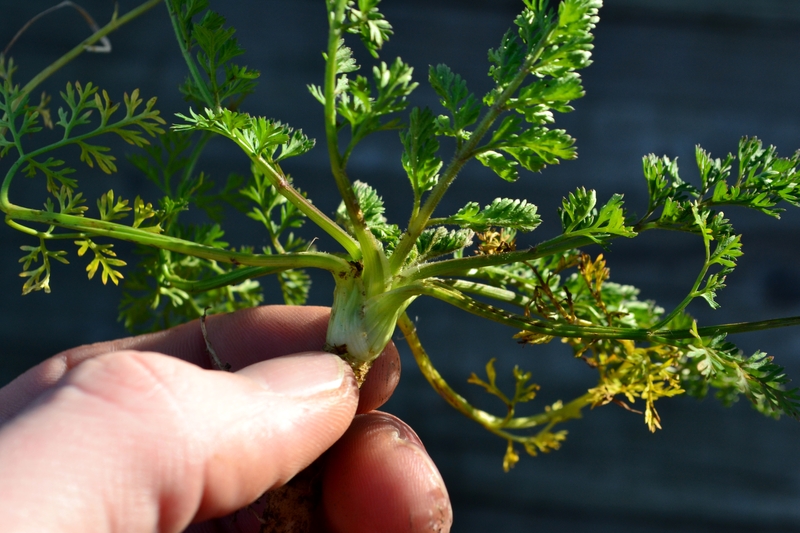 Observe the photos below to see the most significant differences between these two relatives of the Parsley. More often than not Wild Carrot is covered with fine hairs over most of the branch and leaf stems. 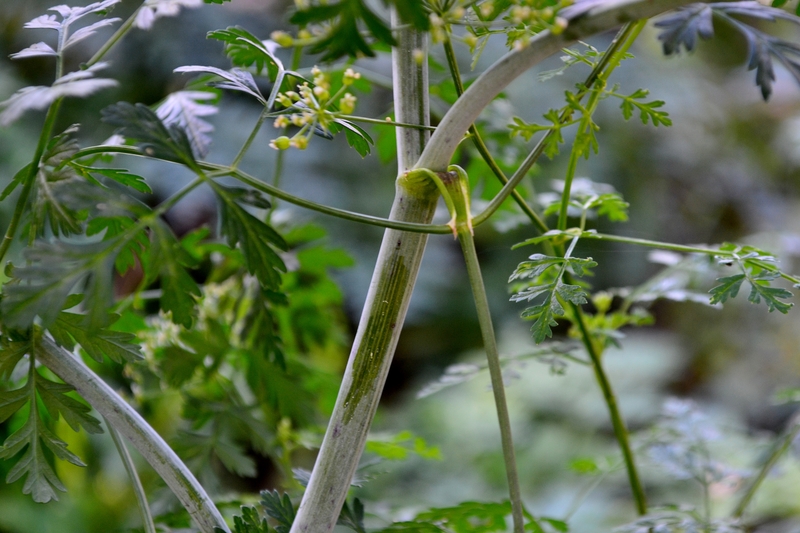 Poison Hemlock is hairless, smooth and typically has purple spots or streaks coloring the stems. 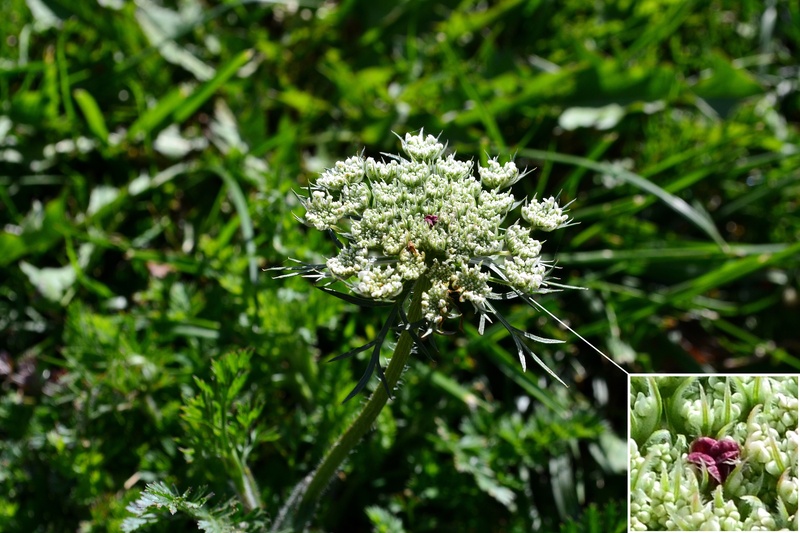 The flowering stalk of Wild Carrot is also covered with fine hairs never coated with white film. 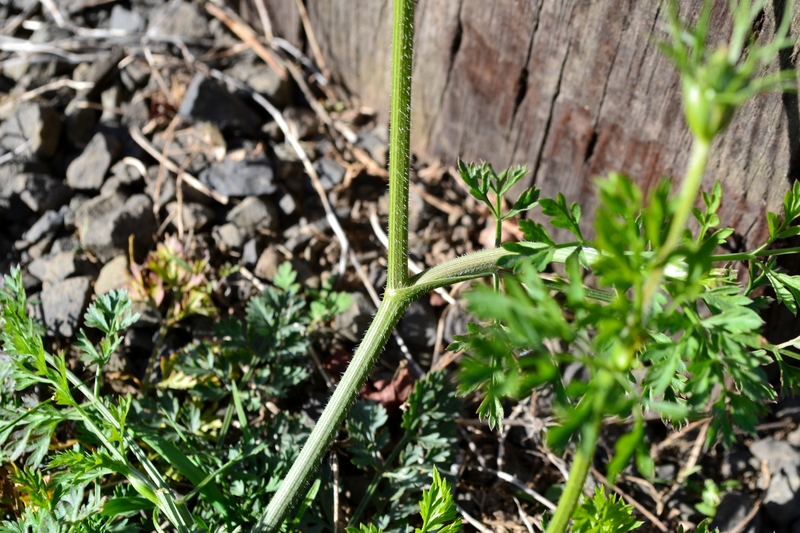 The flower stalk of Poison Hemlock however is both hairless and has a white film that can easily be scraped off. The flower of Wild Carrot is borne on a stem forming a large tightly compact umbel, all white with the typical single purple flower in the center. Poison Hemlock blooms often have multiple flower stems borne off of a main stalk, they are not as dense as the Wild Carrot and lack the single purple flower. The most significant identifiable feature of the Wild Carrot is its carroty aroma. 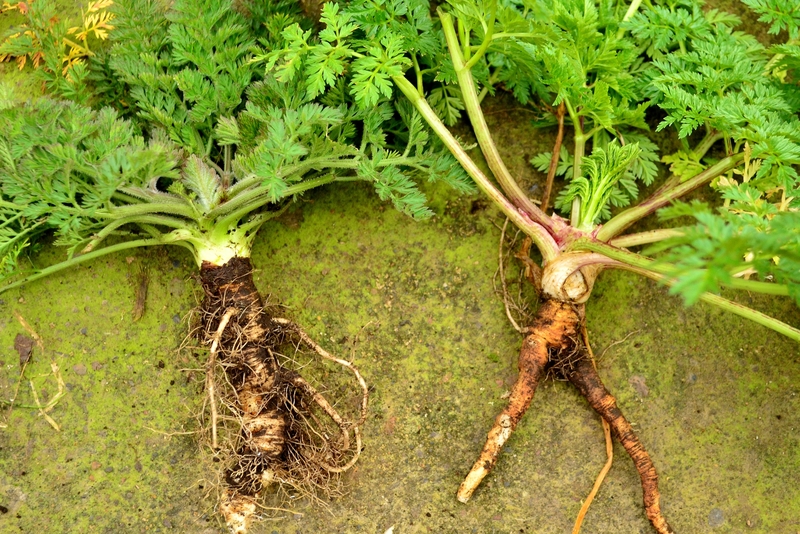 Crack a root in half and take a good whiff… ah… carrot! Poison Hemlock, Fools Parsley and Yarrow as well as carota’s many other lookalikes simply lack that intense carrot scent, if not smelling entirely different at all. 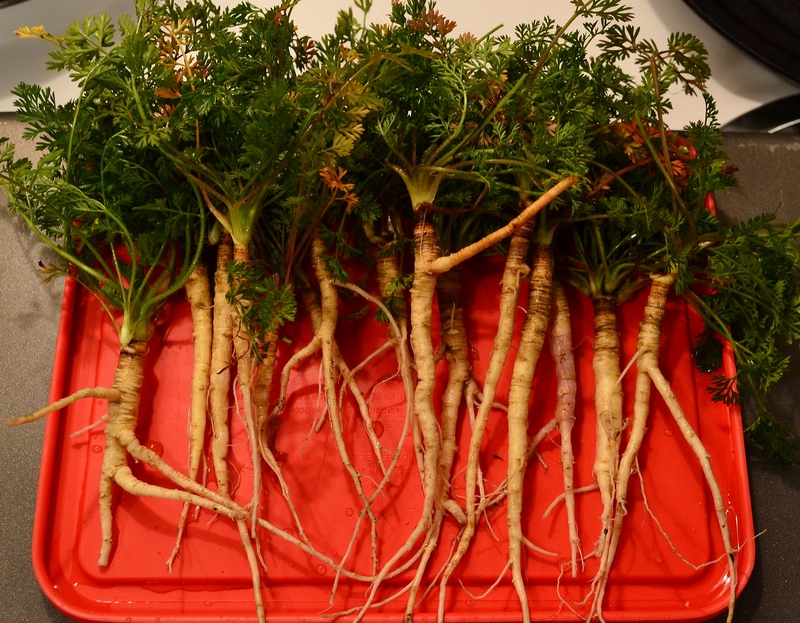 With some practice of comparison, soon you can enjoy this widely abundant and highly nutritious root vegetable. To learn more about identifying wild carrot plus many more wild edibles of North America be sure to check out Nature’s Garden by Samuel Thayer. His book is pack FULL of detailed colored pictures, complete plant descriptions, poisonous lookalikes comparisons, growing season timetables, and its a fun read altogether. It has helped motivate me on multiple occasions and has given me the confidence to get out and forage! I recommend this to both the beginner forager as well the experienced. If you are searching for a competent foraging reference you can click on the following link to where its available for purchase on Amazon. If you ever have any doubt identifying, simply do not eat it! Click on a picture for the following recipes. Excellent post and really useful photos, thank you!